According to some in the crypto space all negative publicity about USDT (USD Tether) is FUD and according to others USDT is a complete scam that will inevitably collapse and pull the whole crypto market down with it. The least we can say is that USDT is highly controversial. If you want to learn more about the background of USDT, please read our explainer article. Noble Bank is the Puerto Rican bank that currently services Tether Company (issuer of the USDT token) and Bitfinex (the exchange that has very close affiliation with Tether). It is supposed to hold the USD funds in reserve that should be backing a large portion of the USDT circulating supply. Now news has come out that this bank has turned insolvent and if it doesn’t acquire funding, it could be a matter of days that the curtain may fall for the bank. Another rumor is also going around that on Kraken Exchange, a trader has converted about $5 million from USDT into USD. Considering the relatively low trading volume in the trading pair on Kraken, this is quite remarkable, especially because it apparently has not affected the price on the exchange more than usual. Kraken is about the only feasible method available for the average crypto investor to actually exchange USD for USDT and vice versa. Does this large trade (if true) mean that somebody has insider information? Also, could the financial trouble of Noble Bank (if also true) have impact on the continuation of Tether Company and/or Bitfinex? Or could this just be FUD (Fear, Uncertainty and Doubt)? One of the articles on this topic suggests that Noble Bank is indeed Tether’s bank and explains that the bank is indeed in financial trouble. If that suggestion were to be true, this could have a serious impact on investors’ trust in the crypto market, because if one of the banks of Tether turns insolvent, that means that per default 1 USDT is not backed on a 1:1 basis to the USD anymore (if that is not already the case). It is worth mentioning that currently around half of all Bitcoin traded worldwide is against USDT, this chart shows the 24 hour money flow of Tether vs. Bitcoin, so the healthy state of USDT does have impact on the crypto markets. On the other hand, a Bloomberg article was published that stated that Noble Bank actually got into financial trouble because Tether and Bitfinex plus many other customers ended their relationship with the bank, by which they lost huge client accounts. 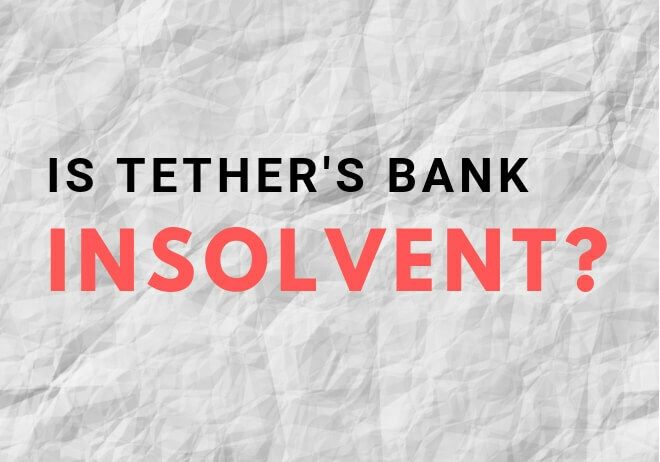 In that case if indeed Noble Bank gets insolvent, Tether and Bitfinex might not be affected as they most likely have already withdrawn their funds. Noble Bank is trying to find a buyer, but has not been able to find one yet, and the clock is apparently ticking. It seems however that this specific issue is not going to have a major effect on Tether and/or Bitfinex. This doesn’t mean they are off the hook for all other suspicions and conspiracy theories that may or may not be true (however, when we do find out, it is probably going to be too late). The crypto community however has gotten used to all the FUD news around Bitfinex and USD Tether – so far without resulting in any catastrophes. However, please be aware of the fact that as long as nobody has seen an official audit of the funds that Tether is holding, the possibility does exist that an inconvenient truth one day comes out and causes a shock wave in the crypto markets. Many regard Tether one of the potential Black Swan events that hangs as a cloud above our heads. Furthermore, even though Tether currently still has a dominant position in most crypto exchanges as the most used stable coin, recently more stable coins have been launched. And these stable coins do have certain levels of regulations behind them, such as the Gemini Dollar, Circle’s stablecoin and Paxos. These stable coins will have official audits and might therefore become better alternatives for exchanges instead of the controversial USDT. It could be the case that Tether might soon have to defend its market share as well. For as long as exchanges don’t offer better alternatives for stable coins except USDT, we encourage crypto investors to perform their own thorough research on all aspects around USDT and keep the controversy in mind if you need to trade or transact using USDT (or any other) as a stable coin in your trading/investing.